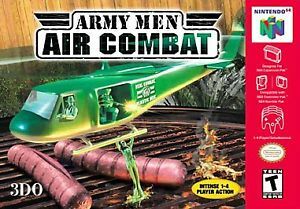 Army Men: Air Combat for Nintendo 64 is a helicopter action game that allows you to be Captain William Blade, the plastic toy pilot of several plastic toy helicopters. You're to do battle once again with the evil tan army and their terrifying war machines. The game features four types of helicopters: Chinook, Apache, Huey and Super Stallion. Real-world settings include backyard, playgrounds, campgrounds and giant sandcastles, spread out over 16 one-player missions.